As science students, we all theoretically understand the effects of different sicknesses – such as bacterial/viral infection and cancer. As people, we are taught to recognize the signs and symptoms of the most common ones. If you have a sore throat for a couple of days along with a fever, you just walk or drive to your clinic and get antibiotics. Within the next day, you’ll be well on your way to feeling normal. ​This is what I saw on my MEDLIFE trip to Peru. During our first tour in Pamplona, we saw the harsh reality of day to day life. Through TV, most of us have become familiar with the conditions in the poor parts of various countries, and we have all heard of the difficulties they have to face. We set up fundraisers and charities to raise money and make a difference in their lives. However, most of us don’t ever truly get to see the difference we have made. Taking part in MEDLIFE’s mobile clinic allowed me not only to witness the difference I have made indirectly, but to help those who ultimately change lives. ​I went on this trip with other students. 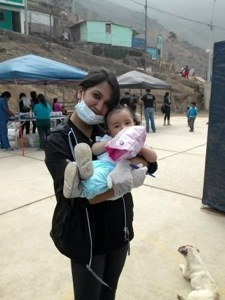 During the clinic week, we assisted doctors, dentists, gynecologists and pharmacists. We had the pleasure of educating children on how to brush their teeth and the importance of brushing your teeth. As well as health care for all, MEDLIFE also provides education on cancer, basic health care, preventive measure and STIs to adults. Due to all the donations and money raised for MEDLIFE, we were able to also provide them with the drugs they needed for free. All in all, we helped 302 patients! ​Additionally, MEDLIFE volunteers also takes part in developmental projects. This includes building schools, bathrooms, and stairs. As I mentioned earlier, we had done a 6km hike through Pamplona on our first day. We hiked from the foot of the hills to the top. I can assure you – that was no easy task. But this is what the people of Pamplona do EVERY DAY! Because they don’t have stairs, they walk up extremely dangerous and steep dirt paths. Young children at the age of 5 or 6 have to hike everyday just to get to school. So MEDLIFE builds stairs, not just to make their lives easier, but also to prevent people from slipping and gravely injuring themselves. 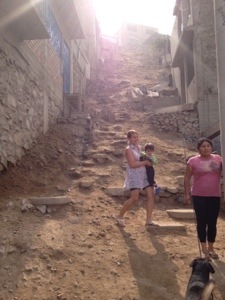 During our clinic week, we were able to complete a staircase in the Buena Vista community. 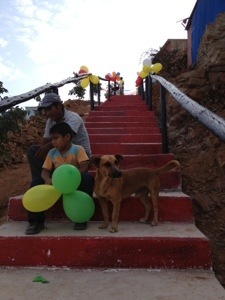 For us, it may have just been a staircase, but for them it is one step towards a better future. Swati Patel is in Microbiology and Immunology.